The Uniden APPCAM 24HR Indoor Camera is a lower end home security entry from a company known for electronics. The camera comes with a small swivel mount. We’re going to look at alternative mounts for this camera. On the back of the Uniden APPCAM 24HR Indoor Camera you will find an industry standard tripod hole. That hole measures 1/4″ – 20 threaded and this is where the provided table stand screws into. This is excellent as it allows the introduction of many different mounts and tripods for this camera. 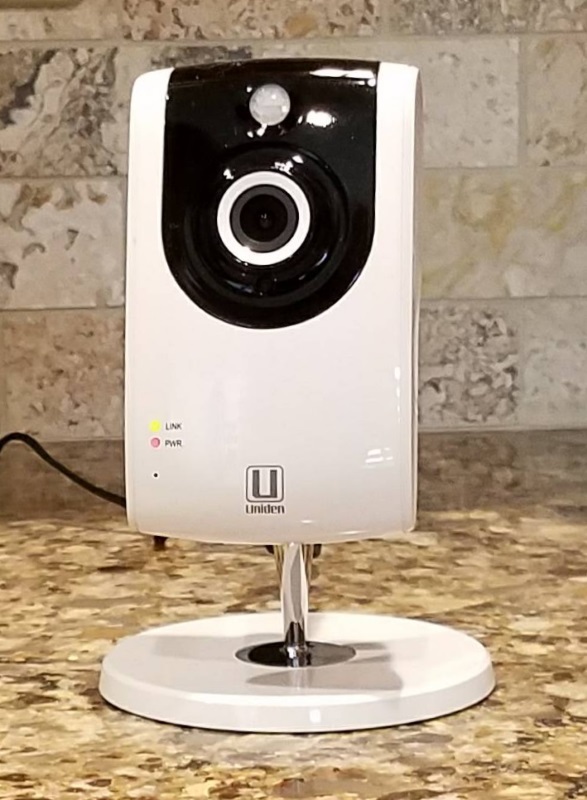 The Uniden APPCAM 24HR Indoor Camera is an oddly shaped camera, especially on the back. There is a tripod hole that sits on a curve. A mount for this camera needs to have a tripod screw and narrow base to ensure it reaches the hole on the curved back of the camera. Out of the box, the Uniden APPCAM 24HR Indoor Camera is designed to sit on a desk or shelf. The metal stand has a ball and socket design so the camera can swivel and rotate. The base is weighted and the camera will be stable using this stand. Also included is a set of screws and anchors for attaching the Uniden APPCAM 24HR Indoor Camera to a wall or ceiling. The camera sitting atop the provided stand can be seen in the photo that accompanies this article. If you aren’t fond of that mount, there are many alternatives so let’s look at what’s out there. First, consider the Acuvar 50″ Inch Aluminum Camera Tripod which works fine with the Uniden APPCAM 24HR Indoor Camera. It’s a traditional tripod so just screw the camera onto the tripod and adjust the head to the right angle. The camera is easy to install and remove from the tripod. Just a matter of turning it so the tripod screw engages. A heavier duty wall or ceiling mount is available using the Arkon Camera Wall Mount for CCTV POV Camcorders Cameras. Attach this metal mount to a wall or ceiling and use the three adjustment points to get the proper angle. This is a much heavier duty mount versus the one in the box with the Uniden APPCAM 24HR Indoor Camera. It’s a much longer mount. Little will get in the way of the camera providing an unobstructed view of the action in front. Another alternative mount for the Uniden APPCAM 24HR Indoor Camera has a suction cup. This is nice for attaching the camera to a window or any smooth surface. Typically marketed for cars, consider the Arkon Suction Cup Mount for Cameras. This mount features a standard tripod screw on a ball and socket design. The mount comes with a vacuum locking base. Press the lever down to create a secure hold on the window. The flexible gooseneck part of the mount is roughly seven inches long. Lastly, a clamp mount comes in handy with a home security camera. Consider the Xventure Xlip Flexible Camera Mount. This mount includes a flexible neck and rotating head. The clamp opens to over two inches. A clamp mount is often used to attach the camera to a rail or desk. Any of these three mounts will improve the usability of the Uniden APPCAM 24HR Indoor Camera. All are well made and support the screw hole on the bottom of the camera.